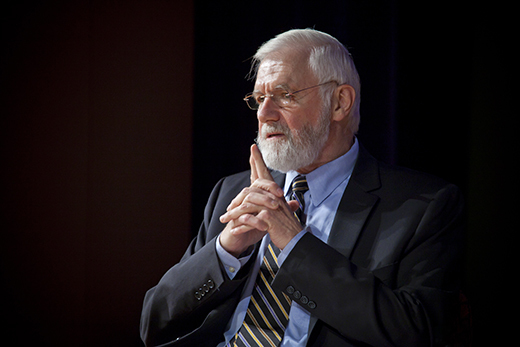 William Foege, MD, the renowned epidemiologist credited with devising the strategy to eradicate smallpox, will deliver the keynote address at Emory University's 171st commencement ceremony Monday, May 9. He will receive the Emory President’s Medal, one of the two highest honors granted by the University. Foege previously served on the faculty of Emory, where he was the Presidential Distinguished Professor of International Health at the Rollins School of Public Health. He also served as executive director and fellow for health policy at The Carter Center and as a senior medical adviser for the Bill and Melinda Gates Foundation. Foege, winner of the Presidential Medal of Freedom in 2012 and recipient of a 1986 honorary degree from Emory, has championed many issues, but his focus has been children in the developing world. He is a strong proponent of disease eradication and control and has taken an active role in the elimination of Guinea worm disease, polio, measles and river blindness. By writing and lecturing extensively, Foege has broadened public awareness of these issues and brought them to the forefront of domestic and international health policies. Foege served as chief of the Smallpox Eradication Program of the Centers for Disease Control and Prevention and was appointed director of the CDC in 1977. In 1984, he and several colleagues formed the Task Force for Child Survival, a working group for the World Health Organization, UNICEF, The World Bank, the United Nations Development Program and the Rockefeller Foundation. Its success in accelerating childhood immunization led to an expansion in 1991 to include other issues that impact children. The task force, headquartered in nearby Decatur, was renamed the Task Force for Global Health and is affiliated with Emory. Raymond Danowski, an American-born fine arts dealer who collected more than 75,000 rare books, posters, periodicals and recordings over several decades, compiling a nearly complete record of all published English-language poetry in the 20th century as well as valuable earlier materials. These materials now reside in Emory's Stuart A. Rose Manuscript, Archives, and Rare Book Library. The Raymond Danowski Poetry Library constantly expands and connects with modern-day works thanks to new acquisitions, an ongoing reading series, and other initiatives. Temple Grandin, a well-known researcher in the field of animal science and a leading advocate for the autism community who has shared her own life story through speaking engagements, books, and the film Temple Grandin. Amartya Sen, awarded the Nobel Prize in Economic Sciences in 1998 in recognition of his groundbreaking research into welfare economics and the understanding of how economic policies affect nations and communities. Dr. Sen will deliver the inaugural Milton Kafoglis lecture at Emory on Sunday, May 8; his topic will be global security.